3 door set, Hudson profile, with white lami glass with mullion strips. 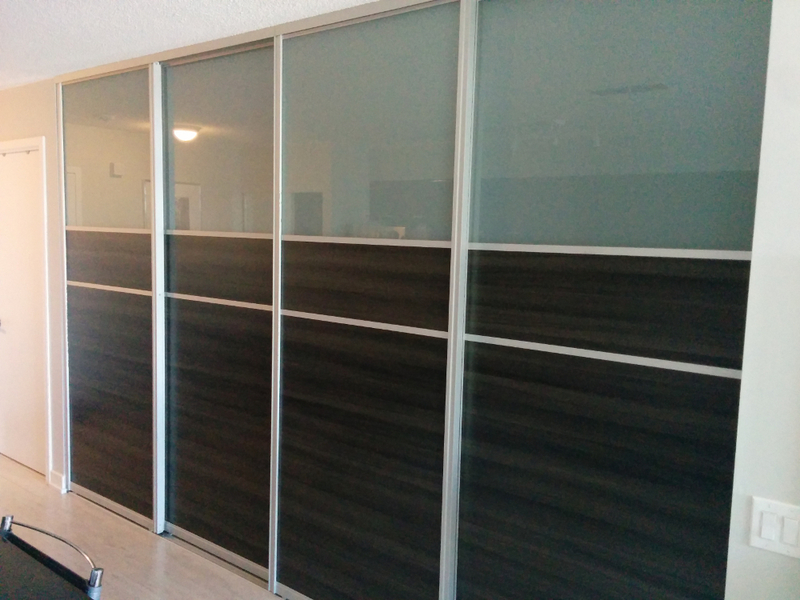 3 door set, Niagara profile, combining white lami glass with milk chocolate melamine and mullion strips. 2 door set, Hudson profile, with white lami glass and mullion strips. 2 door set, Niagara profile, with custom backpainted glass joined with mullion dividers. 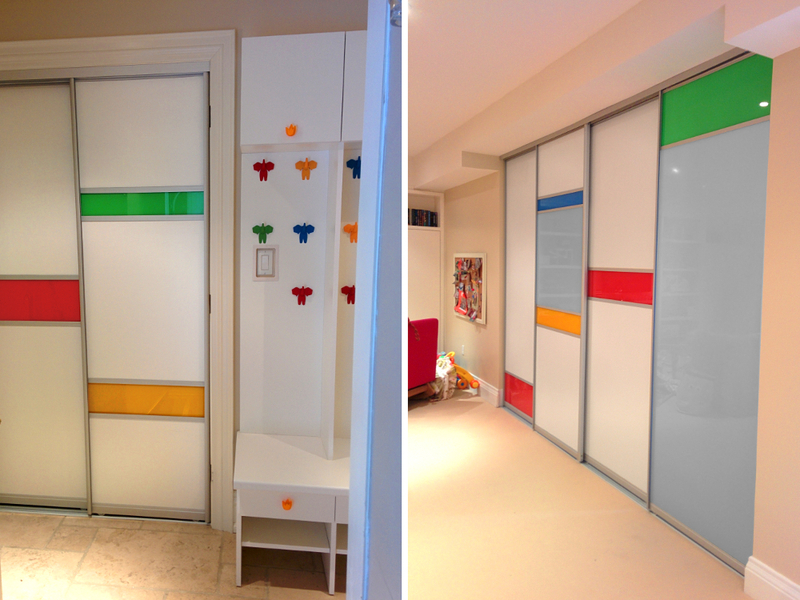 Niagara doors with combination of backpainted glass, white lami glass in mudroom space. 3 door set, Niagara profile, with white lami glass. 2 door set, Hudson profile, with custom backpainted glass inserts. 3 door set in triple track, Niagara profile, with white lami glass and mullion strips. 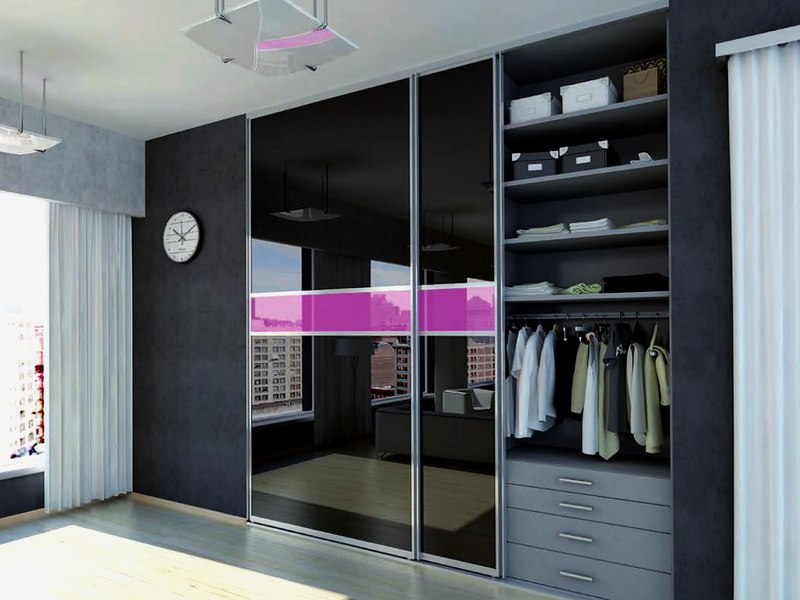 Choose from a wide range of melamine finishes and combine with glass for custom effects. 3 door set, Niagara profile, with custom backpainted glass inserts and mullion dividers. 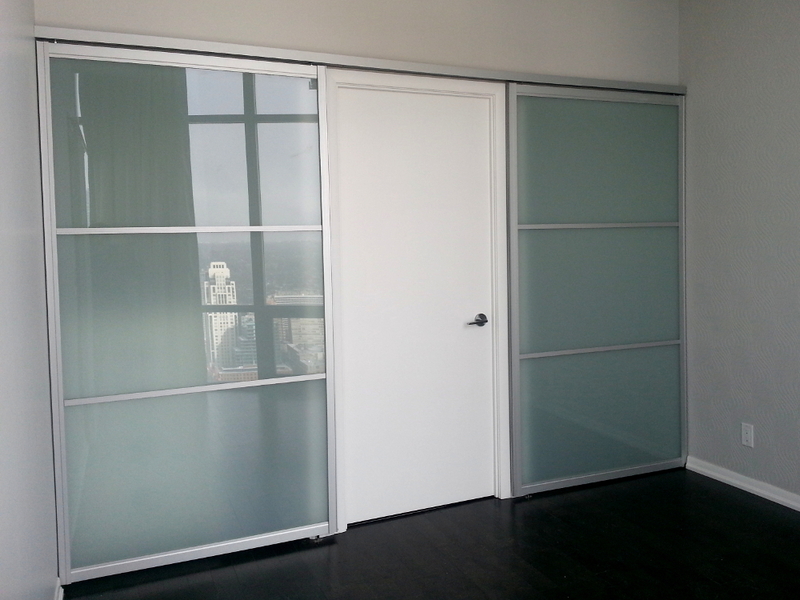 2 door set, Hudson profile, top-hung panels with white lami glass and mullion strips. 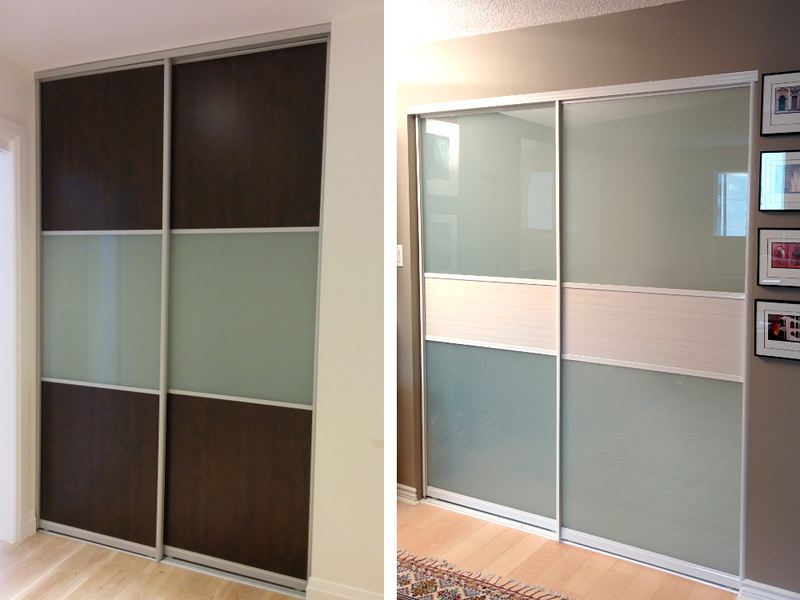 3 door set, Niagara profile, with hardrock maple melamine and white lami glass, joined with mullion dividers. 3 door set in triple track, Niagara profile, with combination of white lami glass and custom backpainted glass. 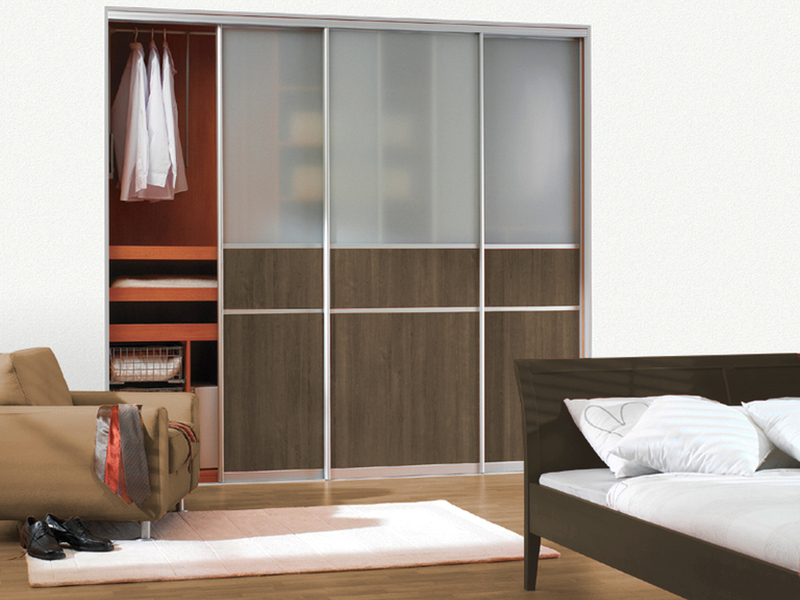 4 door set, Hudson profile, with white lami glass and mullion strips as room divider. 2 door set, Niagara profile, with antique whitewash and chocolate pear melamine inserts. 3 door set, Niagara profile, with custom backpainted glass and mirror inserts. 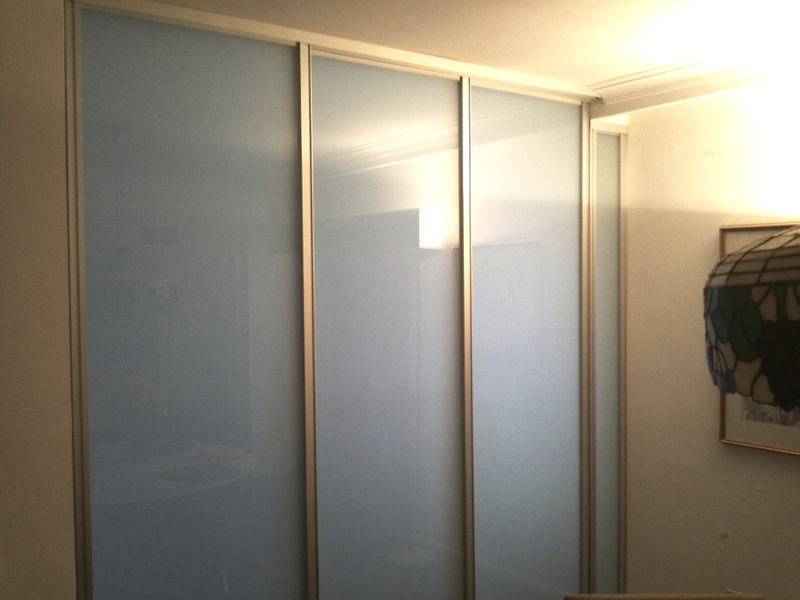 4 door set, Hudson profile, with white lami glass as room divider. 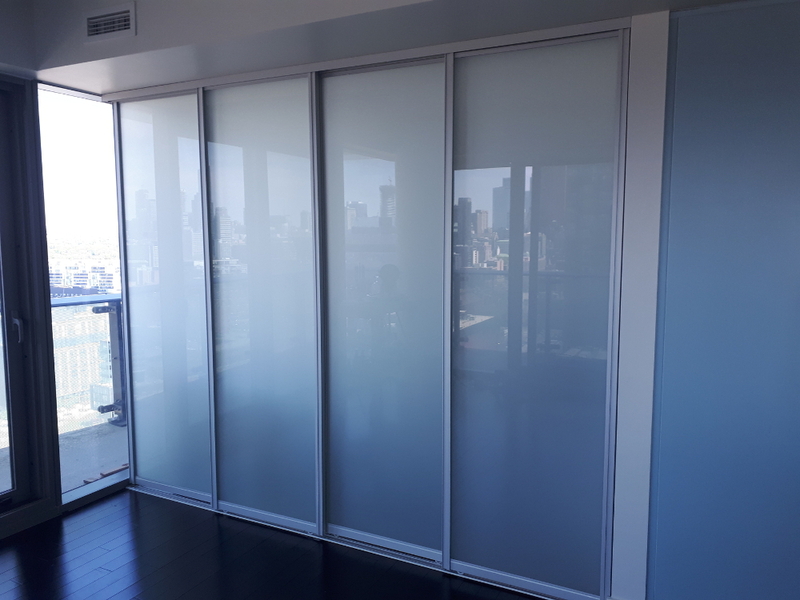 4 door set, Niagara profile, combining white lami glass with tete-a-tete melamine and mullions. 3 door set, Hudson profile, with fixed panel under cornice, with white lami glass. 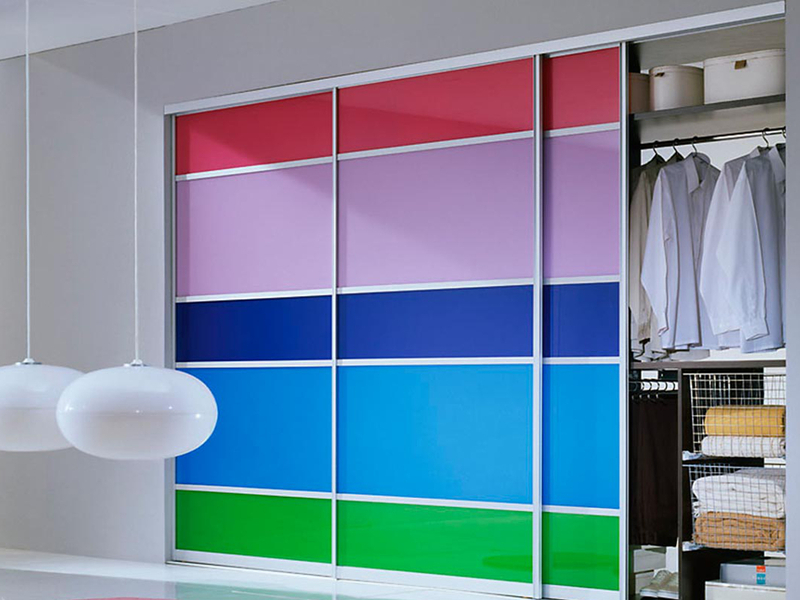 Our exclusive line of custom sliding doors for closets and room dividers features beautiful aluminum frames, and comes with a wide variety of insert options. 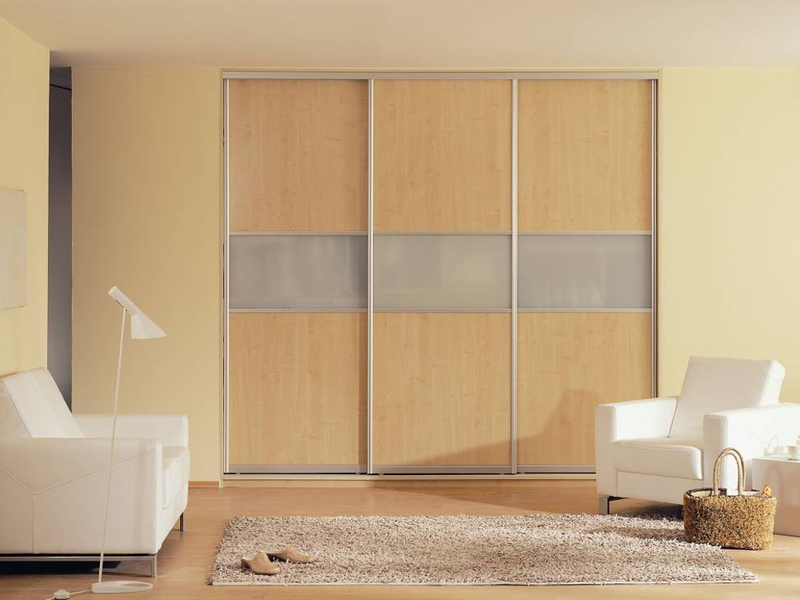 We assemble our custom closet doors in house for a perfect fit. 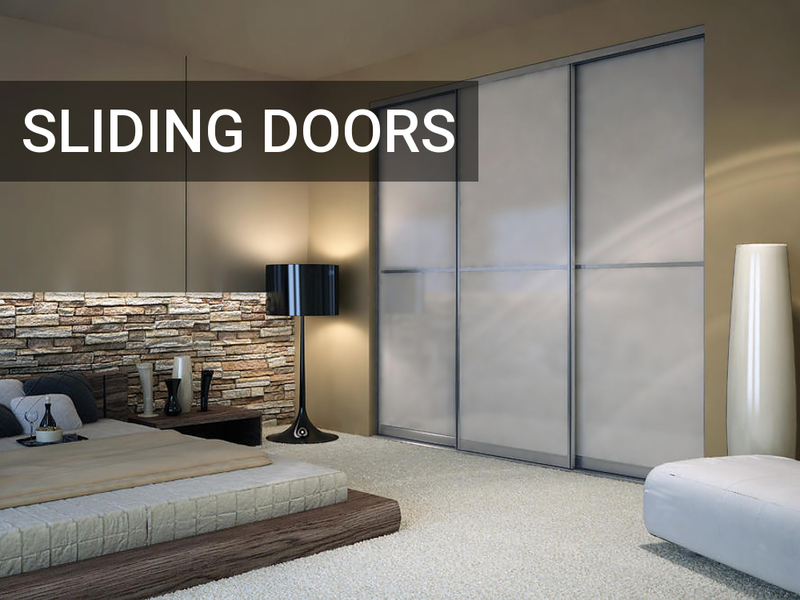 Custom sizing creates a beautiful set of interior doors that fit your room perfectly, without having to rebuild your doorway. 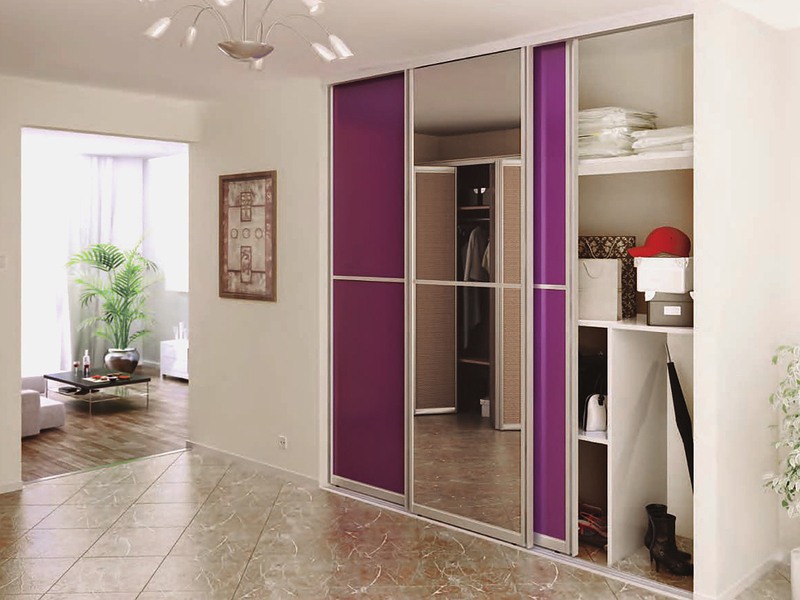 Whether you need to fill a typical closet doorway, divide a room, or wish to create a closet by closing off the end of a room – our sliding doors make excellent room dividers – we have a solution for you. 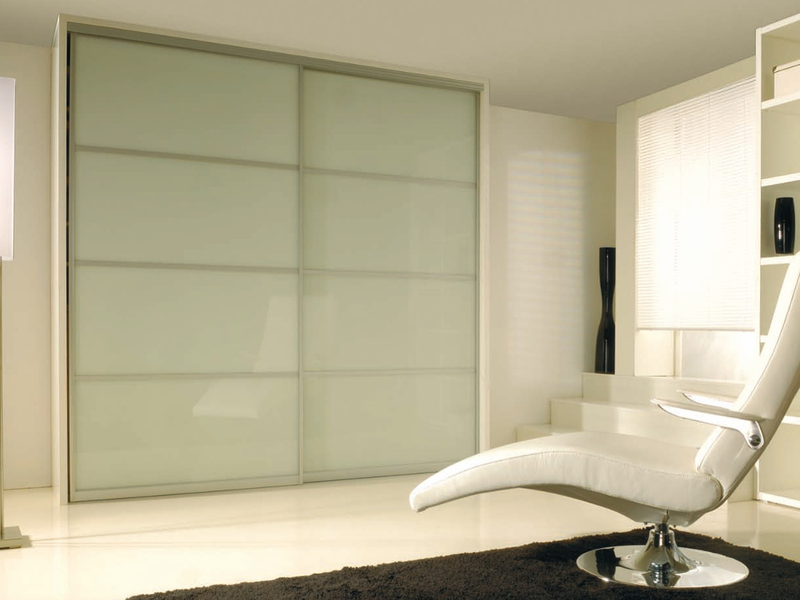 You can opt for a simple arrangement with white laminated glass (aka “white lami”) or frosted glass. 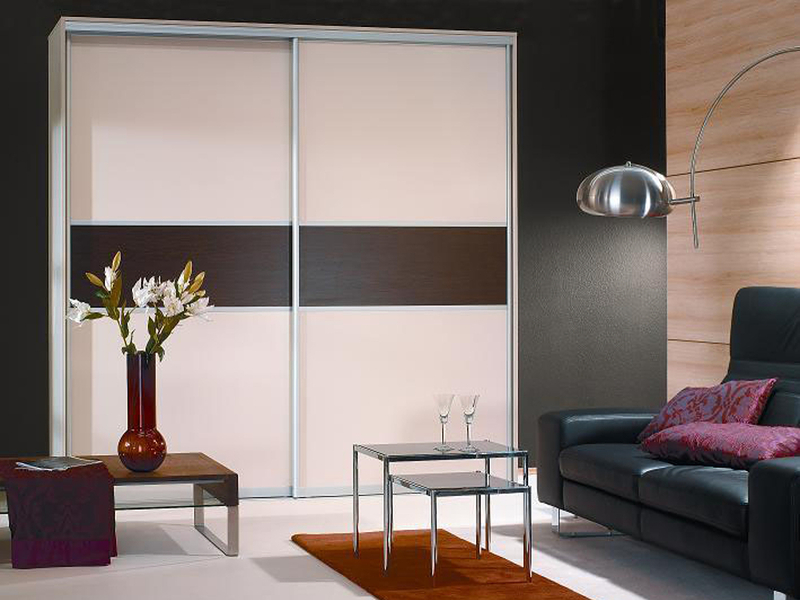 We have a variety of double-sided melamine insert panels, which are great for room dividers too. 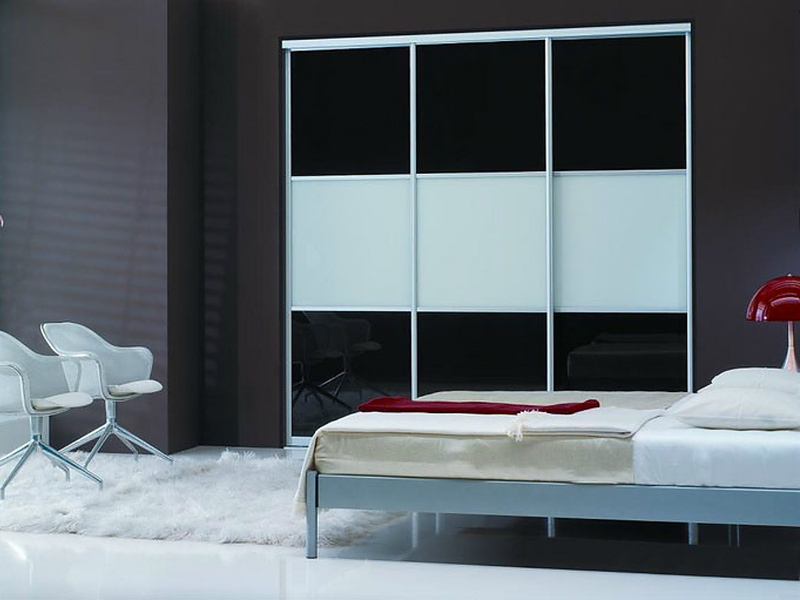 Our system is great for sliding mirror doors. 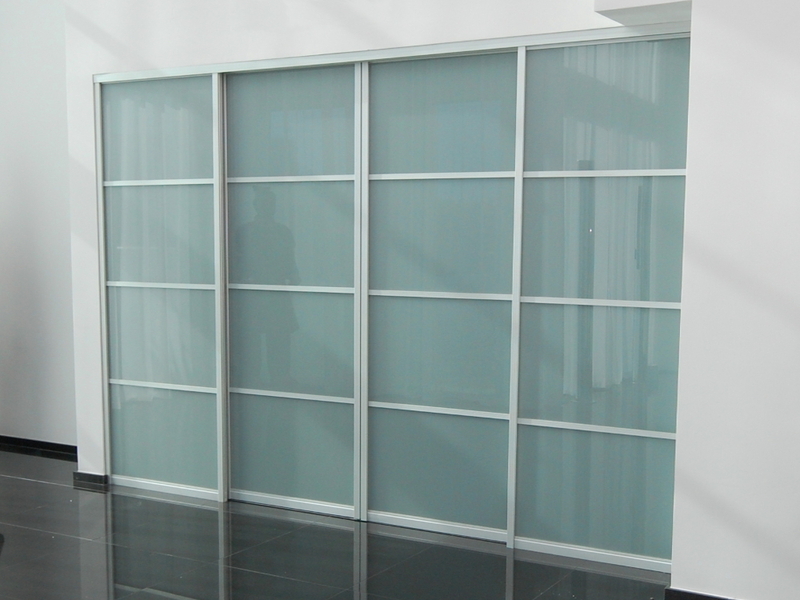 We also offer custom back-painted glass! 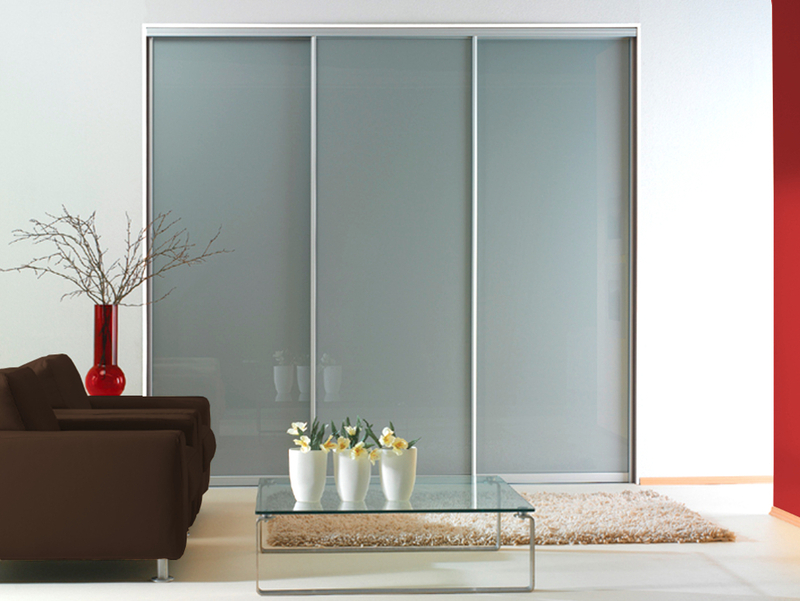 We can also combine materials, and for example, mix and match glass with woodgrain, to truly create a custom solution. Choose from two profiles, Niagara, or Hudson, and two finish options — both profiles are available in the standard aluminum, and the Niagara profile is also available in white. 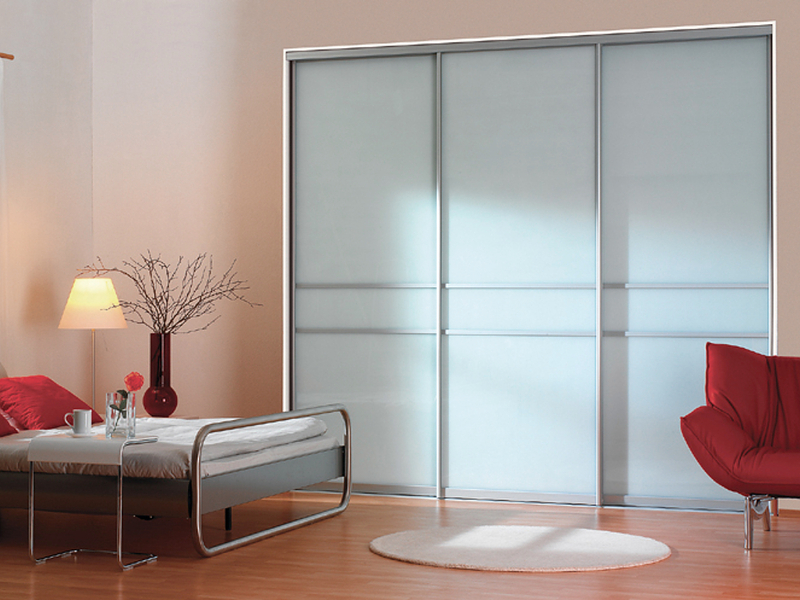 Our custom sliding doors feature smooth-running European hardware, our smoothest rolling doors yet — and are available at prices that can’t be beat, either. For a quick quote, feel free to use the Express Quotation option on this page, or call us for an in-home consultation.